Garage floor epoxy in Huntington Beach is popular because of its limitless aesthetic possibilities as well as its ability to handle a substantial amount of traffic and weight from both vehicles and humans. The garage floor installation process is not particularly complex and can work wonders for your home. Watch this video for a brief preview of the steps of epoxy floor installation. Before your garage floor coating can be applied, you must clean your floor of any stains, residues, or sealers. The floor will then be soaked, rinsed, and dried before you can begin to lay down your epoxy coating. Once these objectives have been completed, you can mix the pigment and the epoxy resin, introduce the catalyst, and apply the material to the garage floor. Another coat may be added after the original coat has been given an adequate amount of time to cure. A garage floor installation is a complex project that is best left to the professionals. When you have decided that you are ready for a new epoxy garage floor, it is important to hire a contractor that specializes in epoxy coating services . 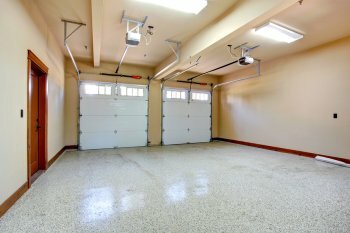 A qualified contractor will be able to install a durable and beautiful garage floor coating that will last for many years to come. If you live in the Orange County area, you should see out a specialist offering Irvine epoxy coating services. To help you get started on your garage floor installation, here is a look at some tips for choosing an epoxy coating contractor. When you are considering hiring an epoxy coating contractor , it is important to research your potential contractor thoroughly. For example, you may want to look into their reviews and ratings from customers in your local area. A contractor with great reviews will be more likely to provide you with quality services. In addition, you may want to research the contractor’s qualifications and licenses. Once you have decided on an epoxy coating contractor in your area, it is a great idea to ask for an estimate. When a contractor provides you with a written estimate, you will get a good sense of how much time and money you will need to invest in your project. If the estimate fits within your budget, you will be ready to take the next steps in your garage floor installation project. If you are considering hiring an epoxy floor contractor, it is important to ask plenty of questions. For example, you may want to ask questions about their recent experiences performing projects that are similar to yours. In addition, you should also ask about any permits that will be required for your coating project. By asking questions, you will be sure to get the most out of your epoxy floor installation.